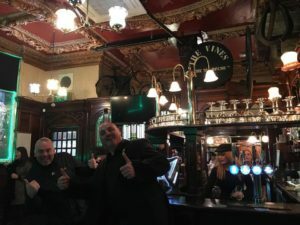 One of Liverpool’s most historic pubs is back in business, complete with a new look to add to more than a century of tradition. The Vines, which is affectionately referred to ‘The Big House’ by locals, has opened its doors once again after its sudden closure earlier this year in July. One of the most recognisable buildings in the city, the pub has stood at the edge of Copperas Hill on Lime Street for more than 100 years, and the news of its closure left many customers disappointed. The Vines first opened in 1867 and was rebuilt in in 1907 by Walter William Thomas, who also designed the landmark Philharmonic pub in Hope Street. The much-loved venue, which is next to the Adelphi Hotel, has now undergone a refurbishment to give off an authentic Irish feel, whilst also maintaining a lot of its oldest most treasured features. Mr Gaughan said: “We have added a new Irish men memorabilia and the upholstery has been recovered. The function room is still undergoing some work at the moment to clean and varnish the word works and floors. The lively atmosphere returned as customers were welcomed back during its weekend relaunch, filled with live entertainment and special guests.